Oxy Fuel Welding (OFW) is short for oxyacetylene welding. The process uses a fuel gas, usually acetylene, and oxygen to weld and cut metals. It’s one of the oldest of welding methods, though it has declined in use with the rise of arc welding. Today, we see Oxy Fuel welding and cutting most often used by artisans and metal workers, small, independent shops, and in situations where it is difficult to access the electricity needed to run other types of welding machines. Oxy Fuel welding is a very traditional type of welding, relying on a torch to weld the metals. There is no need for filler material or pressure to create the weld. Using fuel gas and oxygen, the torch heats the metal pieces to the point that they become molten and join together upon cooling. Flame temperatures can reach 3,200 degrees Celsius. Lower temperatures can be achieved by using propane, hydrogen, and coal gas instead of acetylene. Oxy Fuel welding is a wide-ranging definition; it includes any type of welding operation that uses fuel gas and oxygen to create the heat needed for the weld. The oxygen is burned off as metal oxide slag. The two gases are mixed in the right proportions in a mixing chamber, which is usually found as part of the welding tip assembly. The chemical action of the flame can be adjusted by making ration adjustments in the mixing chamber. If the torch does not mix fuel with oxygen, it is not considered an Oxy Fuel application. 3 distinct flame settings are possible: neutral, oxidizing and carburizing. Produces enough heat to weld steel. Portable, easy to operate equipment. Produces less intense flames and UV rays than other methods. High degree of operator control over heat input, weld zone temperature, and weld bead size and shape. Excellent for repair welds, thin sheets, tubes, and small pipe diameters. Quality is dependent on operator skill, equipment, and plate conditions. Not ideal for stainless steels or aluminum. Better suited for alloys and mild steels. May require more finishing, depending on operator skill and intended use of finished piece. Large heat affected zones (HAZ). 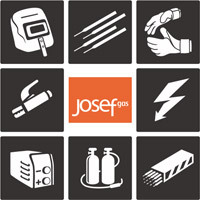 Visit Josef Gas online or in person at 201 Basaltic Road in Concord, Ontario to purchase fuel gases, oxygen, and oxy-fuel welding supplies and equipment.